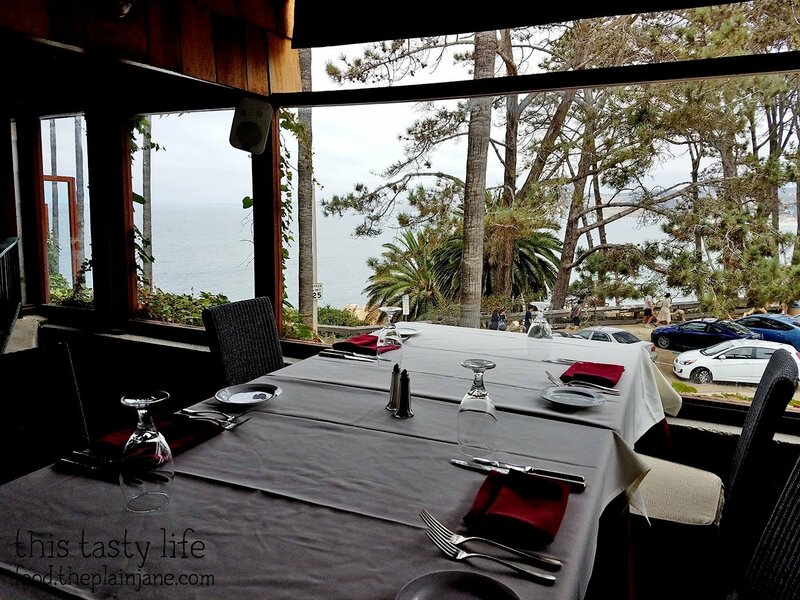 Recently I was invited to check out a new restaurant over in La Jolla Cove. It’s a new Italian restaurant called Acquavite. 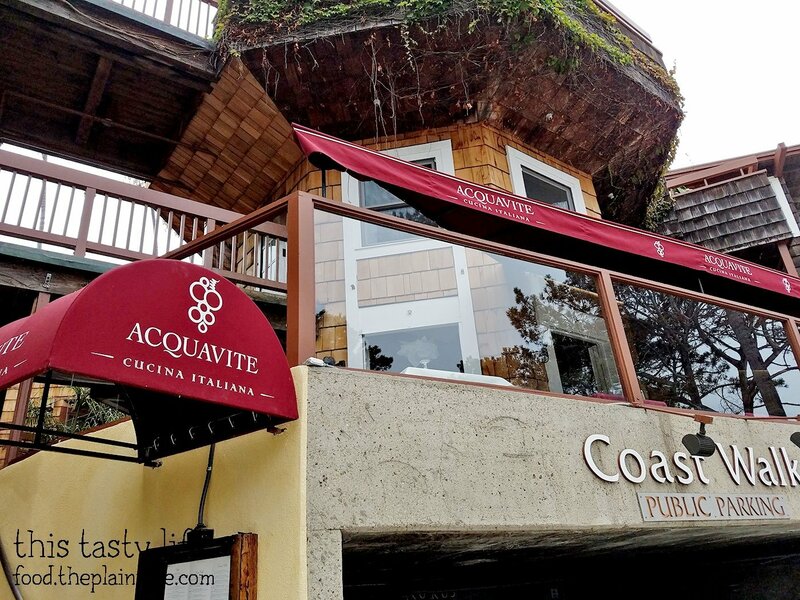 Acquavite is nestled right into the heart of the cove, just overlooking the ocean. 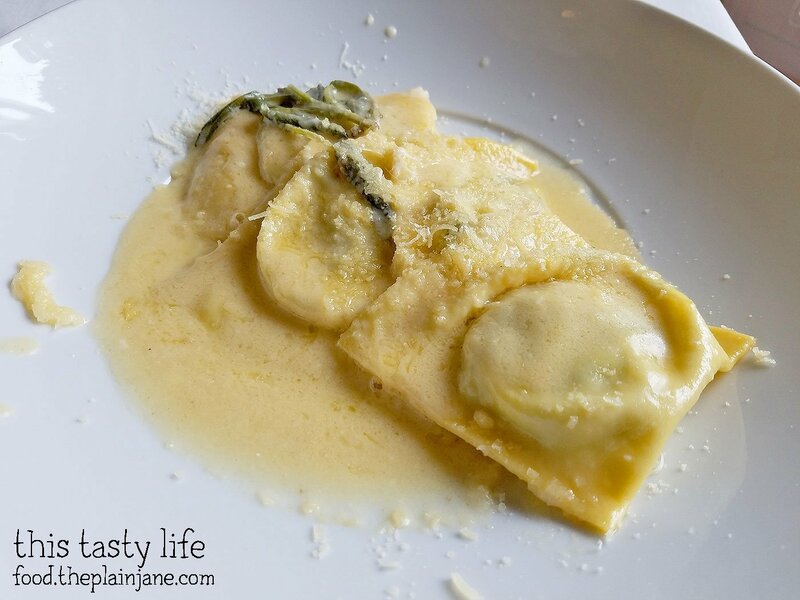 Thoughts of handmade pasta filled my head and I happily accepted the invitation. Jake and I ended up getting there a little bit early and walked around the cove before heading into the restaurant. To my surprise, Acquavite is right above a parking garage that I have NEVER noticed before. The parking garage is quite claustrophobic and tiny inside but we managed to snag a spot in there. Very useful since there was a concert going on at the Cove that day! As soon as we entered the restaurant, we were greeted by the owner, Nicola. I had been in touch with Nicola’s wife, Sonia, who was the one that set up our visit to the restaurant. He gave us a tour of the restaurant. Above is the patio area in the restaurant. The restaurant has a few different levels and areas to it. This is the upper patio with large window panes so you can see the ocean and do some supreme people watching. 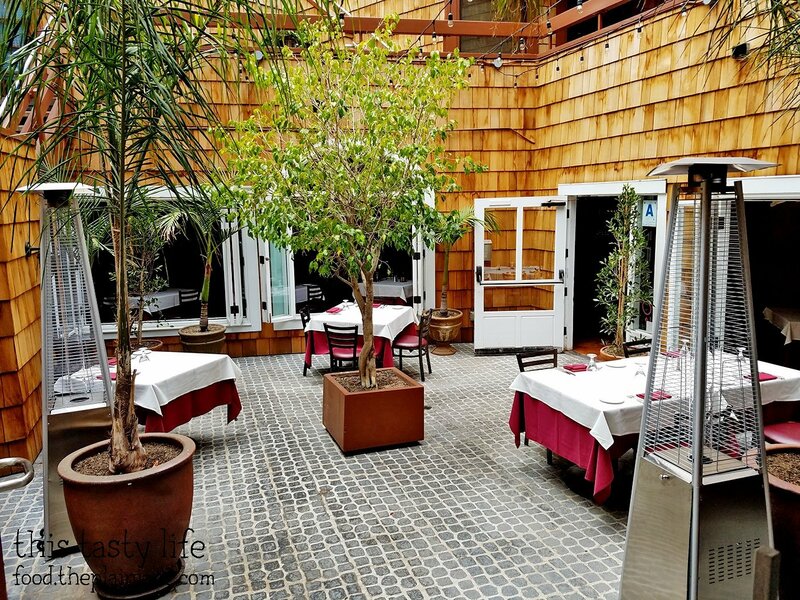 This is one of the indoor areas, right outside the patio. And this is another indoor area. 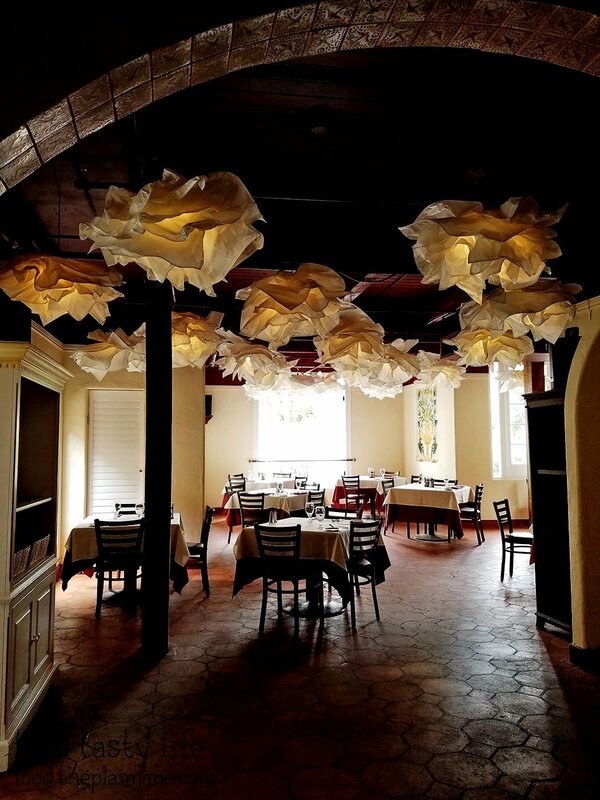 I love their light fixtures! They look like big blooming flowers. This is the room we sat in, right next to the big open window. There was a lovely breeze that wafted in making it nice and relaxing. No one else was in this room and it felt like we had the restaurant to ourselves. They’re planning on getting some new menus soon so I suspect it won’t look like this for long. 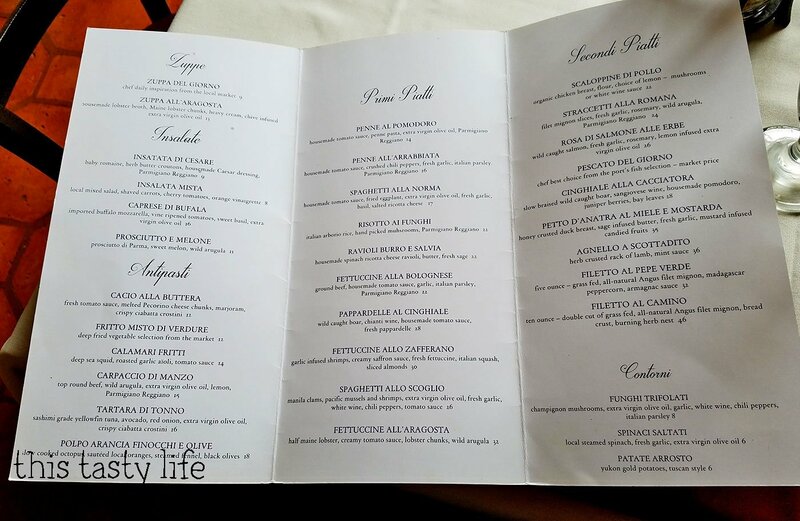 Jake and I were able to speak with executive chef Filippo Piccini who hails from Tuscany. He told us a little bit about the menu and how they make everything from scratch here. We knew we were going to be in for a treat! The chef treated us to this sea bass ceviche starters. 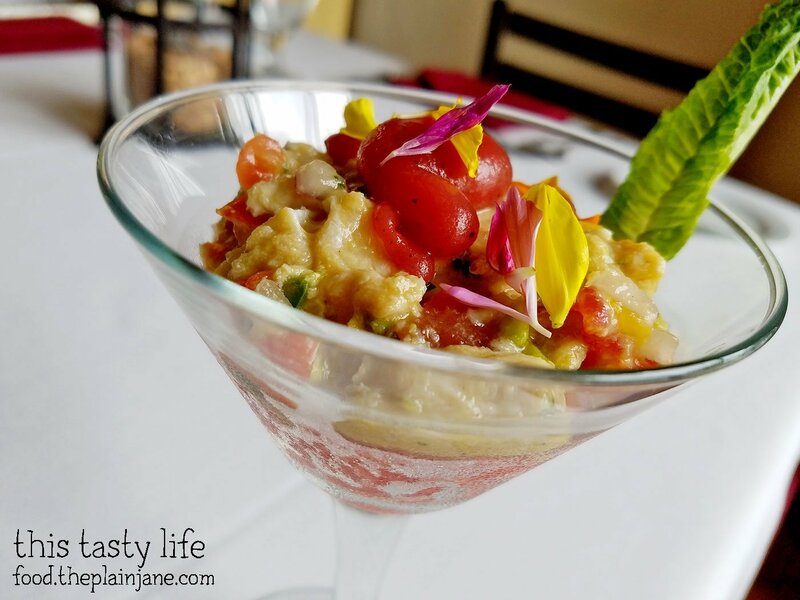 Normally I’m not really into ceviche but this cool, refreshing appetizer was great on a warm summer’s day. That thing on top that looks like a grape tomato – that’s actually watermelon! Here’s another angle so you can see the bottom of the glass, which was mostly filled with watermelon. 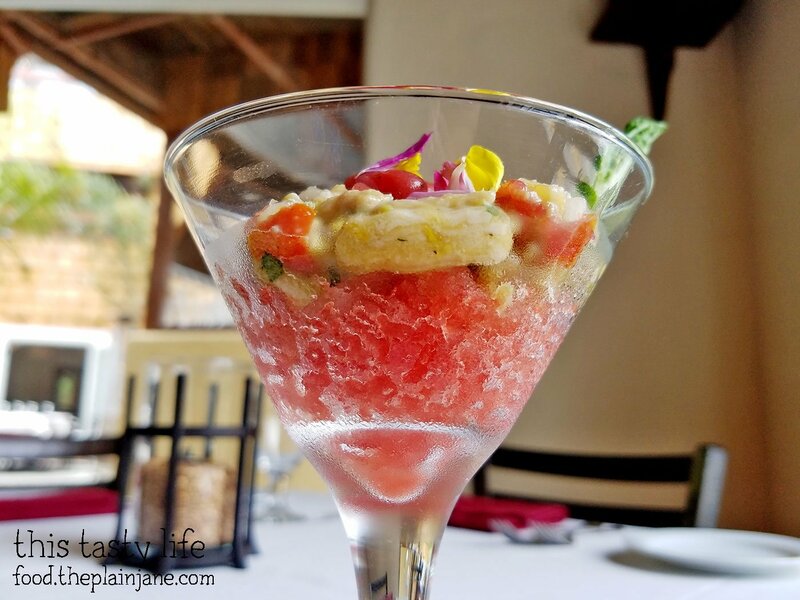 It was almost like a watermelon slushie with seafood on top. I like how beautiful is looked and how cool and refreshing it was. The sea bass was good, though I prefer it cooked in a less raw-fishy way (ha). We were presented with a variety of wines before each course. 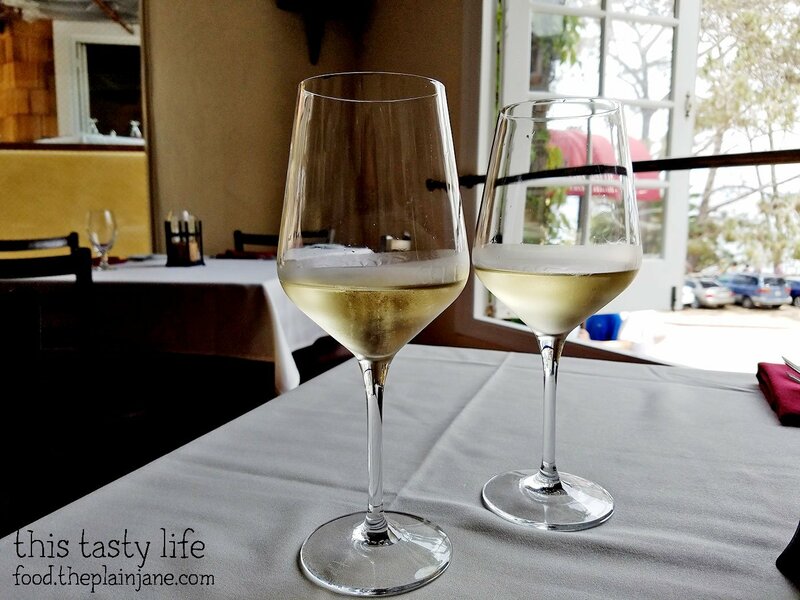 I liked the white wines that were chosen for us by the chef, who became certified in wine when he was just 16 years old (wow!). For a starter, I choose to try the octopus. The octopus has a special preparation here where the octopus goes into hot and cold water alternatively so the octopus starts to curl up on itself. Then it’s slow cooked and served with fresh oranges, crunchy fennel, and olives. The octopus is sliced and paired with fresh herbs and a delicious olive oil. The octopus was tender and soft but still held a lot of chew to it. As I chewed on it I got hints of ocean flavor the more I chewed on the octopus. 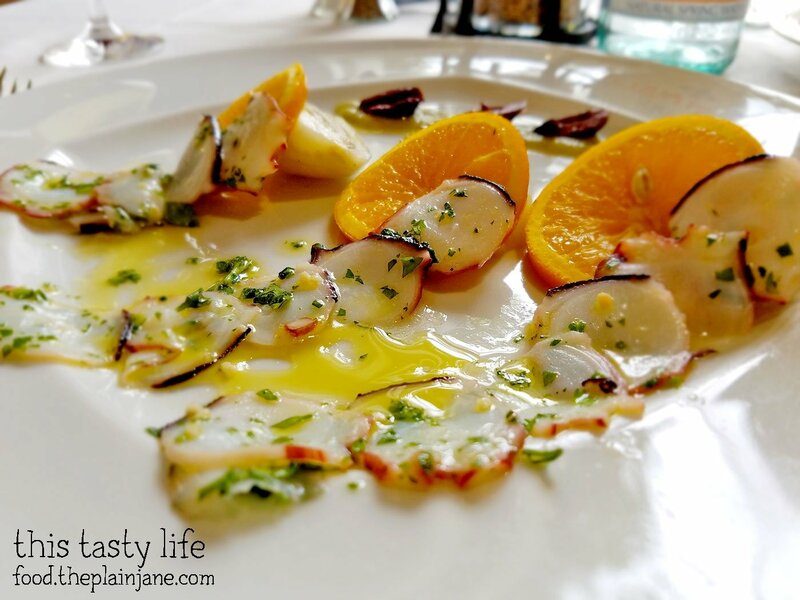 The sweet oranges helped to bring out the light saltiness and the fennel added a crunch of texture to the dish. It such a unique way to eat octopus and I loved it! Jake decided to get this dish. 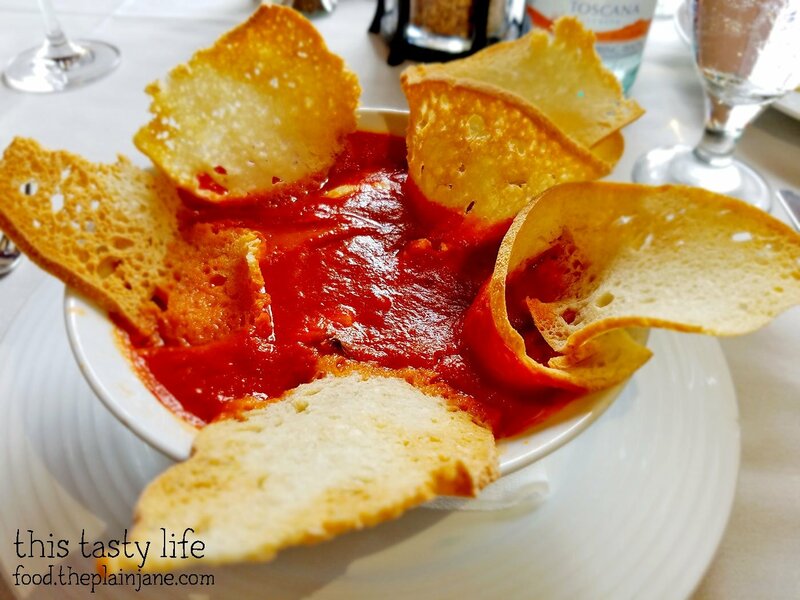 You can’t see them but nestled within the fresh tomato sauce are large chunks of pecorino cheese. It was like a little treasure hunt to find the pockets of cheese! The sauce was sweet and held a ton of flavor within its depths. A very simple, elegant, and delicious dish. Jake wished for a bit more bread with this one so he could take full advantage of the sauce. 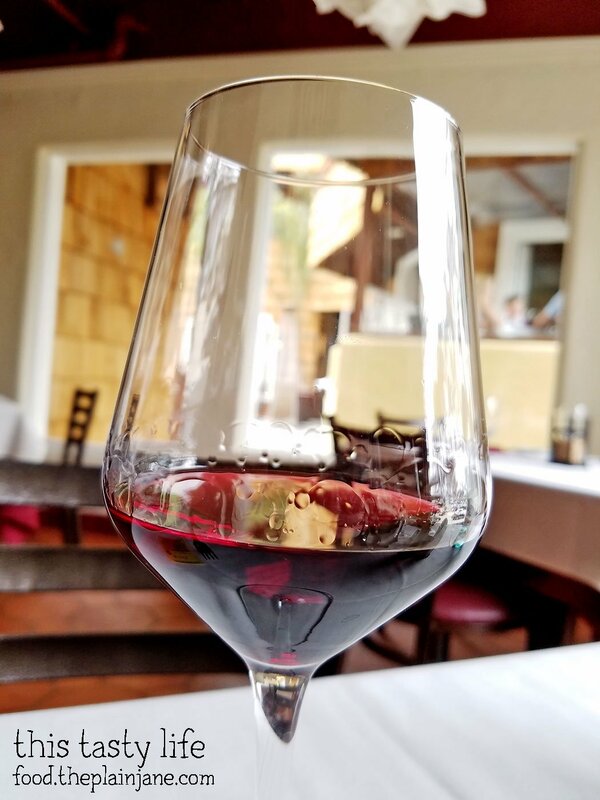 Another wine – I believe this was a blended red sangiovese. I got quite excited when this dish was placed before me. First of all the presentation is just lovely! That squash around the outside is so delicate and pretty and I loved the color of this dish which comes from the creamy saffron sauce. I could smell the saffron immediately and see flecks of it through the dish. The fettuccine is freshly made and it makes an incredible difference. The fettuccine was tender but had a nice bite to it and the sauce – goodness, it was breathtaking! The saffron isn’t too heavy handed and the sauce was so incredibly creamy. There was just enough sauce to coat the pasta, which I enjoyed. The shrimp was large and plump and was fully infused with all of the flavors of this dish. I could have easily eaten all of this plate in one sitting, but I held back and saved some so I could enjoy it the next day (and it held up extremely well). I’d come back for this dish alone! Jake decided to get the ravioli which is also made in house. The delicious safe infused sauce paired so nicely with the creamy ricotta and spinach filling of the ravioli. I only had a bite since I was in love with my shrimpy pasta dish. 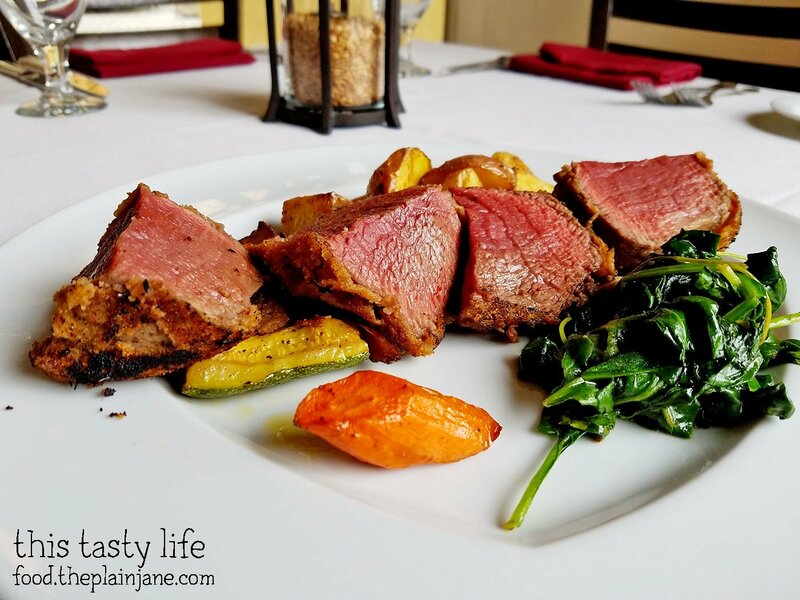 Before we ordered our meal, Nicola told us about this crazy filet mignon dish that they have at Acquavite. Jake decided to order it and I’m glad he did. The filet mignon is brought out tableside. It’s cut into pieces and had a breaded crust on the side. 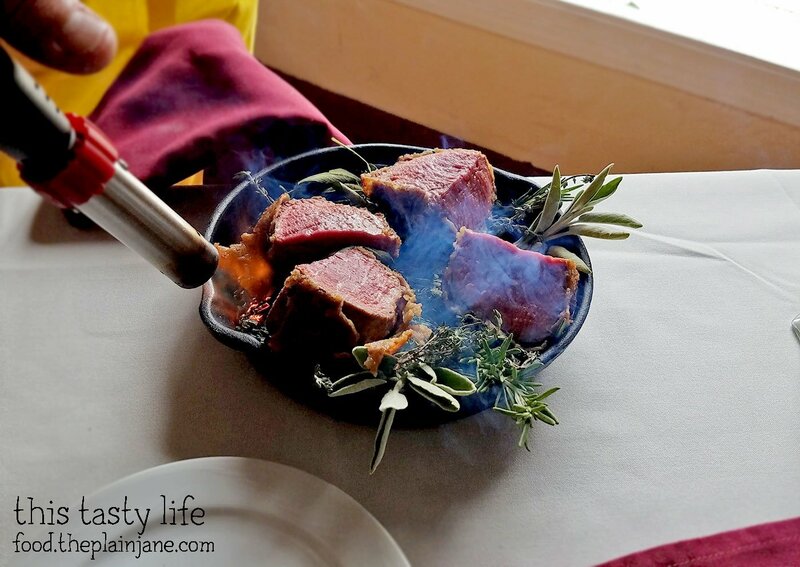 The meat is nestled into a cast iron pan in a nest of herbs – all kinds of herbs. 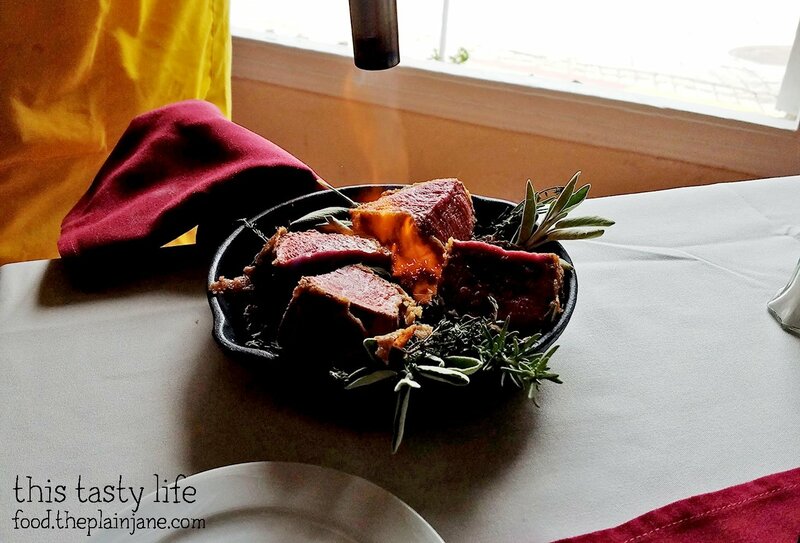 The chef uses a blowtorch to light the herbs and set them on FIRE. Isn’t that cool?! The smells of the herbs hits you immediately and makes your mouth start to salivate a little thinking about how delicious this dish is going to be. After the chef finishes burning the herbs, he plates it before you and this is the result. You can see the breaded crust had a little bit of a burnt look to it but it didn’t taste burnt at all. The meat was melt-in-your-mouth-oh-my-goodness-is-this-for-real tender. Stunning. Amazing. I thought I didn’t like filet mignon very much until I tried this. Jake kept giving me bites of his filet and I’d be amazed all over again at the filet. I got a less showy dish for my main entree, though it was very good as well. I chose to get the duck! 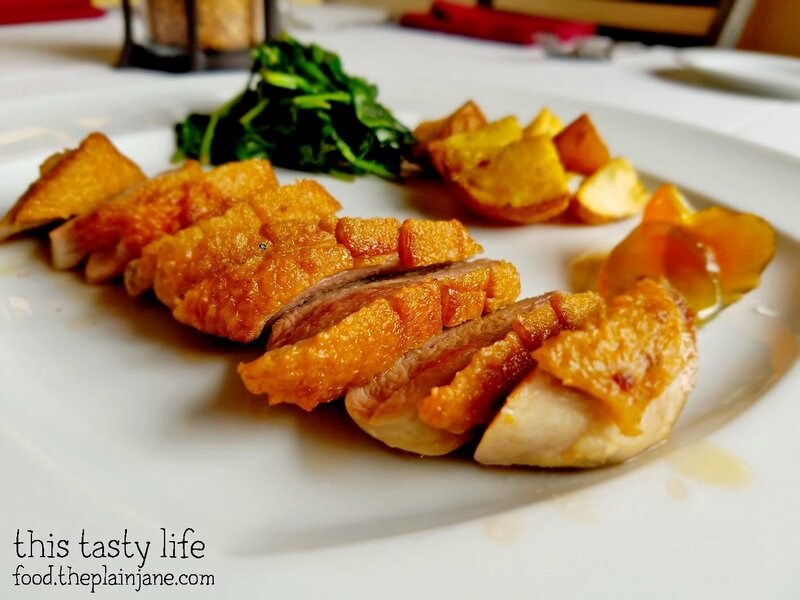 This duck breast has a honey crust and you could taste that extra bit of sweetness in the meat. My only small complaint was that I wished the duck skin had been crispier. I loved the flavor but I wished for that little bit of crunch on the skin. It was still very good though and like I said, just a small complaint. We were also treated to dessert! Look at this fancy little tiramisu! 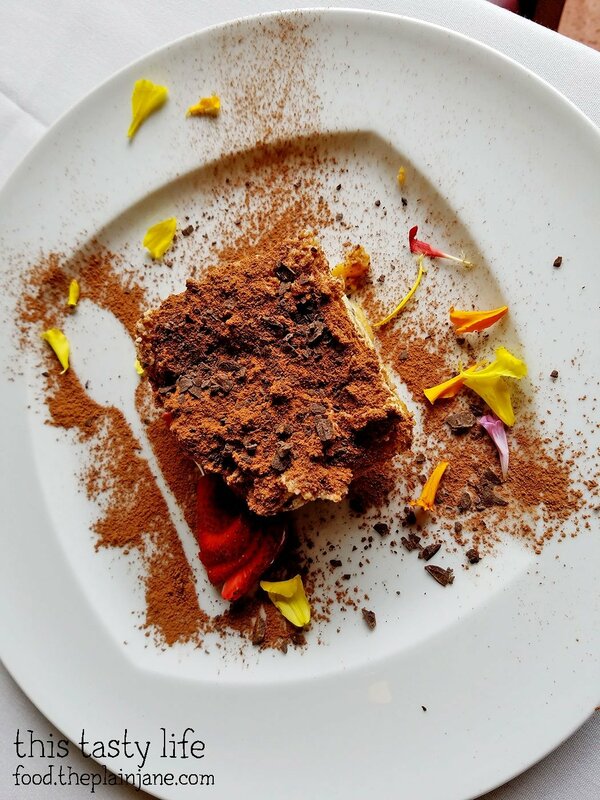 The cocoa powder dusting and edible flowers made this dessert look totally over the top! 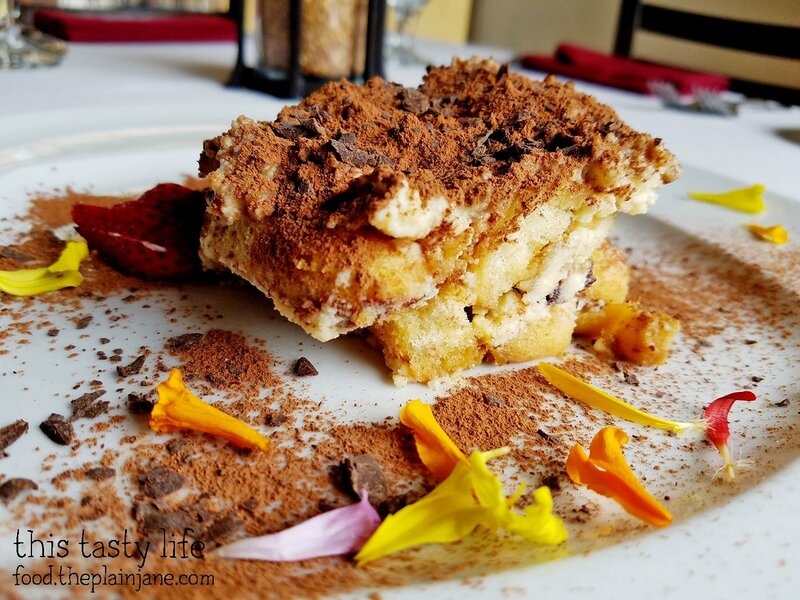 I liked the extra bits of chocolate bits that were all over the top of the tiramisu. The layers of cake and mascarpone were delicious and well… let’s just say that I cleaned the plate. Jake isn’t a fan of tiramisu so he was luckily treated to a stunning looking cannoli. 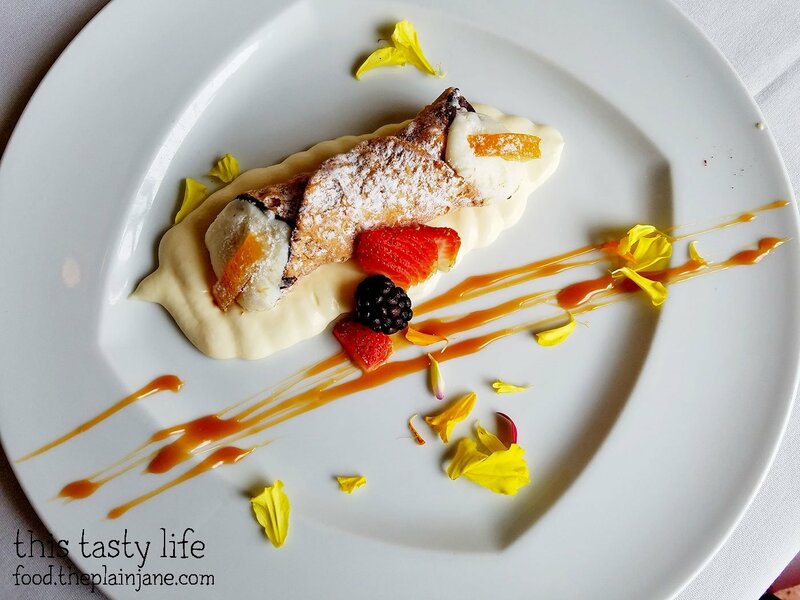 This might just be the fanciest cannoli I’ve ever seen with it’s pretty streaks of caramel sauce, edible flowers, fresh fruit, and extra filling. Jake really enjoyed it and we both loved that luscious filling. 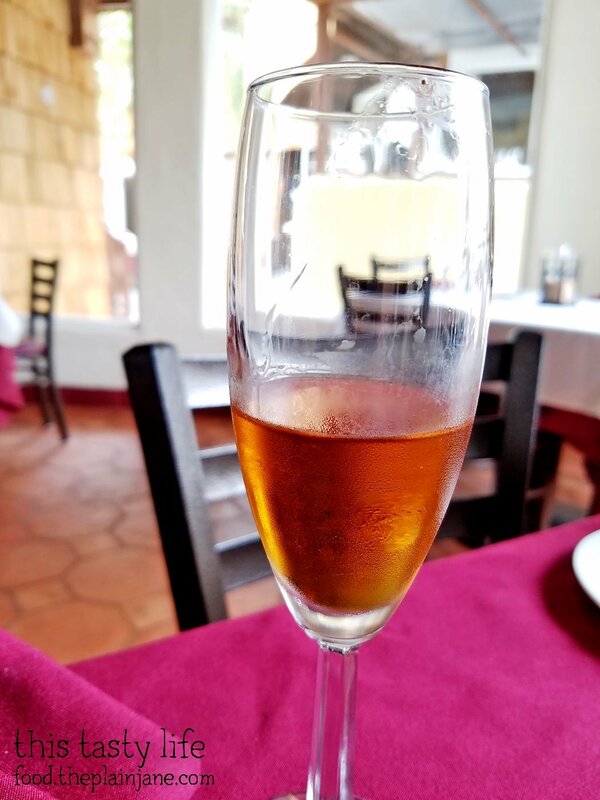 We also got some Vin Santo dessert wine with our last course and it was so DELICIOUS. Note that this is the only one that I asked the name for because I enjoyed it so much with our desserts. That hardly ever happens. I was determined to not drink anymore wine, too, but a little sip of this stuff and I just had to finish it. Jake and I had an incredibly lovely and highly enjoyable visit to Acquavite. The food prepared here is incredible: fresh, delicious, and made with the utmost care. 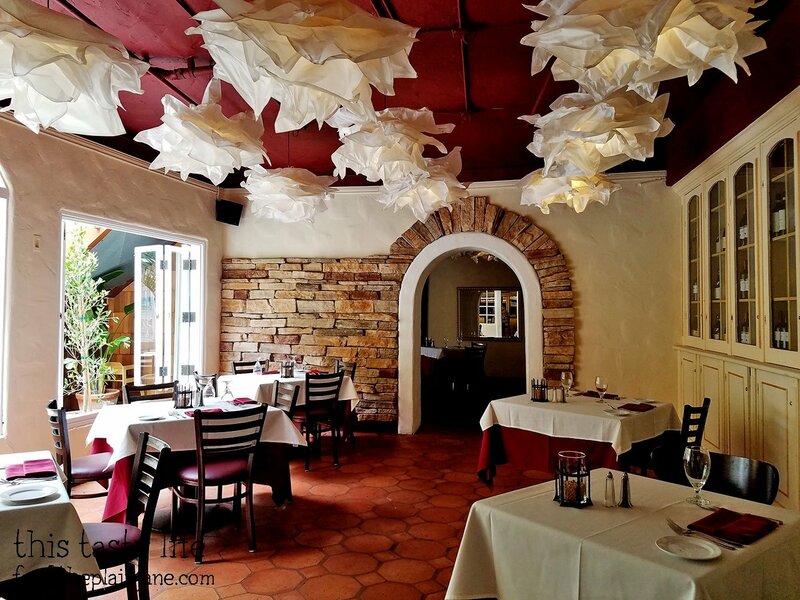 We’d definitely love to visit again for a special occasion or a fancy night out – I want to eat that saffron fettuccine again and again and… well, you get the idea. 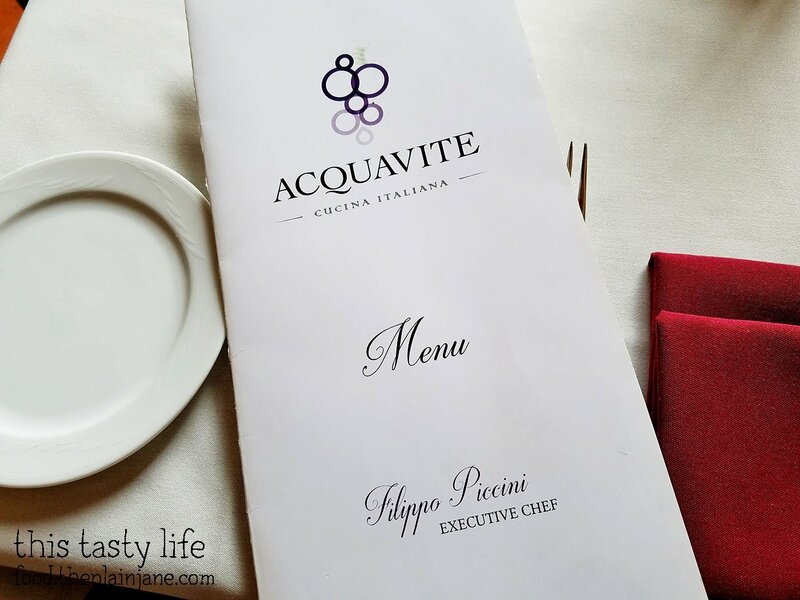 Disclaimer: I was invited to dine at Acquavite on behalf of the restaurant. Our meal was complimentary. I was not further compensated for this post and all opinions are my own. 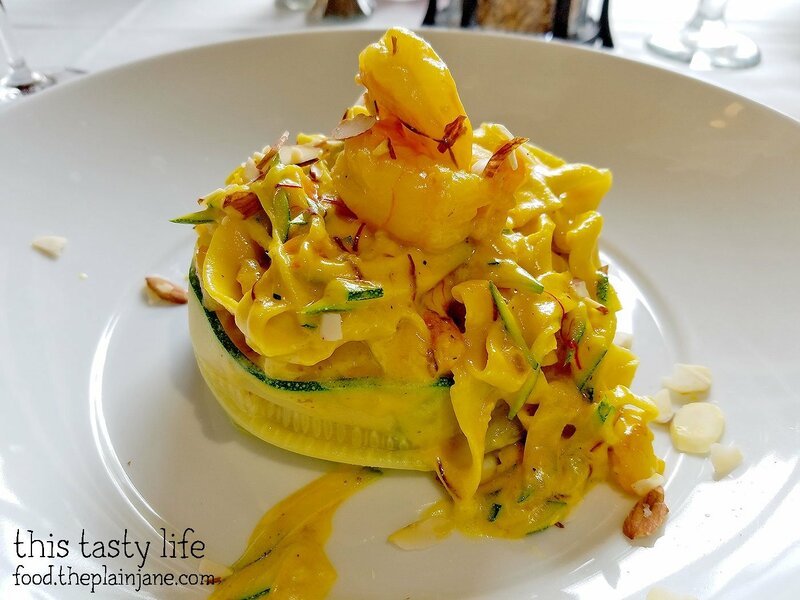 The fettuccini with the shrimp looks simply amazing!! This place is definitely going on my short list!! Hi Marla – That fettuccini was AMAZING. I’m thinking I might want to go there again as a birthday treat! Very fancy! The octopus dish looks really good, sliced so thinly. Hi CC – Fancy and delicious! You would have enjoyed the octopus, it was so delicate and delicious. I was surprised it was sliced, actually. Most places make you cut it yourself (haha).